Rapid anesthesia detoxification requires infusion of intravenous medications which quickly remove the opiate drugs from the opiate receptors in the body. All opiate drugs attach to the opiate receptors inducing the feeling of euphoria and pain relief. The specialized RDD opiate detoxification procedure eliminates the extreme pain and suffering associated with opiate withdrawal. Once the opiate drugs are removed from the receptors, the worst of the withdrawal is over, all done under anesthesia in a licensed surgical facility by skilled Board Certified physicians with many years of experience. The RDD Method™ of opiate anesthesia detox was developed by RDD Center, a private, confidential drug-addiction treatment facility. Only $7,900* can free you or a loved one from opiate addiction. Once the opiates have been removed from the opiate receptors, the patient is clean and the worst of the withdrawal is over. Our patients report that The RDD Method™ eliminates most of the pain and suffering associated with typical opiate withdrawal. It is quick. The opiate detox procedure occurs during approximately 60 minutes of moderate sedation. All patients are admitted into a licensed surgical facility, sedated and taken to the O.R. for the detoxification procedure. We are the only anesthesia detox facility that has 2 Board Certified physicians present for the entire detoxification procedure. Our patients rest while being monitored by a physician, circulating paramedics and one-on-one private duty bedside care in the post recovery area. It is exclusive. Because we are the only providers of The RDD Method™, our patients travel from all over the country, as well as, from around the world. 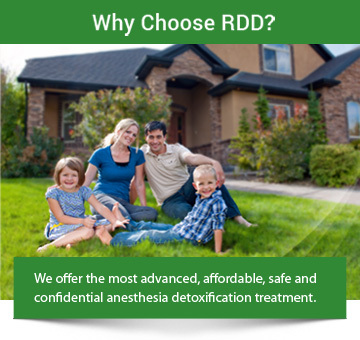 The RDD Method™ of opiate anesthesia detox is not for everyone, nor should it be seen as a quick fix for serious drug dependency. Rather, it is a powerful first step toward a lifetime of freedom from addiction. So carefully consider all of your options, including calling the RDD Center to speak with an experienced, professional nurse or intake coordinator. *Excludes any unforeseen needed diagnostic tests that may be deemed necessary per physician request.